Muhammadu Buhari GCFR (born 17 December 1942) is a Nigerian politician currently serving as the President of Nigeria, in office since 2015. He is a retired major general in the Nigerian Army and previously served as the nation's head of state from 31 December 1983 to 27 August 1985, after taking power in a military coup d'état. The term Buharism is ascribed to the Buhari military government. He unsuccessfully ran for the office of president of Nigeria in the 2003, 2007, and 2011 general elections. In December 2014, he emerged as the presidential candidate of the All Progressives Congress for the March 2015 general elections. Buhari won the election, defeating the incumbent President Goodluck Jonathan. This marked the first time in the history of Nigeria that an incumbent president lost to an opposition candidate in a general election. He was sworn in on 29 May 2015. In February 2019, Buhari was re-elected President, defeating his closest rival Atiku Abubakar by over 3 million votes. Muhammadu Buhari was born to a Fulani family on 17 December 1942, in Daura, Katsina State, to his father Hardo Adamu, a Fulani chief, and mother Zulaihat. He is the twenty-third child of his father. Buhari was raised by his mother, after his father died when he was about four years old. Buhari enrolled at age 19 in the Nigerian Military Training College (NMTC) in 1962. In February 1964, the college was upgraded to an officer commissioning unit of the Nigerian Army and renamed the Nigerian Defence Academy (NDA) (prior to 1964, the Nigerian government sent cadets who had completed their NMTC preliminary training to mostly Commonwealth military academies for officer cadet training). From 1962 to 1963, Buhari underwent officer cadet training at Mons Officer Cadet School in Aldershot in England. In January 1963, at age 20, Buhari was commissioned a second lieutenant and appointed Platoon Commander of the Second Infantry Battalion in Abeokuta, Nigeria. From November 1963 to January 1964, Buhari attended the Platoon Commanders' Course at the Nigerian Military Training College, Kaduna. In 1964, he facilitated his military training by attending the Mechanical Transport Officer's Course at the Army Mechanical Transport School in Borden, United Kingdom. From 1965 to 1967, Buhari served as commander of the Second Infantry Battalion and appointed brigade major, Second Sector, First Infantry Division, April 1967 to July 1967. In July 1966 Lieutenant Muhammadu Buhari was one of the participants in the "July Rematch" or so called "Counter-Coup", led by Lt-Col Murtala Muhammed, that overthrew and assassinated Nigeria's first self-appointed military Head of State General Aguiyi Ironsi, who had assumed leadership of the Nigerian government after a failed coup attempt on 15 January 1966, which overthrew the elected parliamentary government of Nigeria (also known as first republic). Other participants in the coup on 28 July 1966 included 2nd Lieutenant Sani Abacha, Lieutenant Ibrahim Babangida, Major Theophilus Danjuma, Lieutenant Ibrahim Bako among others. The coup was a reaction to the January coup where a group of mostly Igbo officers led by Major Chukwuma Kaduna Nzeogwu overthrew the democratically elected government of Prime Minister Abubakar Tafawa Balewa. Many Northern soldiers were aggrieved by the murder of senior politicians, Prime Minister Abubakar Tafawa Balewa, northern regional premier, Ahmadu Bello, and four senior officers from northern Nigeria: Brigadier Zakariya Maimalari, Colonel Kur Mohammed, Lt-Cols Abogo Largema and James Pam. The counter-coup was very bloody leading to the murder of mostly Igbo officers. Among the casualties were the first military head of state General Aguiyi Ironsi and Lt Colonel Adekunle Fajuyi, the military governor of the Western Region. Buhari was assigned to the 1st Division under the command of Lt. Col Mohammed Shuwa, the division had temporarily moved from Kaduna to Makurdi at the onset of the Nigerian Civil War. The 1st division was divided into sectors and then battalions  with Shuwa assisted by sector commanders Martin Adamu and Sule Apollo who was later replaced by Theophilus Danjuma. Buhari's initial assignment was as Adjutant and Company Commander 2 battalion unit, Second Sector Infantry of the 1st Division. The 2 battalion was one of the units that participated in the first actions of the war, they started from Gakem near Afikpo and moved towards Ogoja with support from Gado Nasko's artillery squad. They reached and captured Ogoja within a week with the intention of advancing through the flanks to Enugu, the rebel capital. Buhari was briefly the 2 battalion's Commander and led the battalion to Afikpo to link with the 3rd Marine Commando and advance towards Enugu through Nkalagu and Abakaliki. However, before the move to Enugu, he was posted to Nsukka as Brigade Major of the 3rd Infantry Brigade under Joshua Gin who would later become battle fatigued and replaced by Isa Bukar. Buhari stayed with the infantry for a few months as the Nigerian army began to adjust tactics learnt from early battle experiences. Instead of swift advances, the new tactics involved securing and holding on to the lines of communications and using captured towns as training ground to train new recruits brought in from the army depots in Abeokuta and Zaria. In 1968, he was posted to the 4 Sector also called the Awka sector which was charged to take over the capture of Onitsha from Division 2. The sector's operations was within the Awka-Abagana-Onitsha region which was important to Biafran forces because it was a major source of food supply. It was in the sector that Buhari's group suffered a lot of casualties trying to protect food supplies route of the rebels along Oji River and Abagana. From 1970 to 1971, Buhari was Brigade Major/Commandant, Thirty-first Infantry Brigade. He then served as the Assistant Adjutant-General, First Infantry Division Headquarters, from 1971 to 1972. He also attended the Defence Services Staff College, Wellington, India, in 1973. From 1974 to 1975 Buhari was Acting Director of Transport and Supply at the Nigerian Army Corps of Supply and Transport Headquarters. Then Lieutenant Colonel Buhari was among a group of officers (led by Colonels Ibrahim Taiwo, Joseph Garba, Abdulahi Mohammed, Anthony Ochefu, Lieutenant Colonels Shehu Musa Yar'Adua, Ibrahim Babangida and Alfred Aduloju) who overthrew the Head of State, General Yakubu Gowon. From 1 August 1975 to 3 February 1976, General Murtala Mohammed, appointed Buhari as Governor of the North-Eastern State, to oversee social, economic and political improvements in the state. Buhari also briefly served as Governor of Borno state from 3 February 1976 to 15 March 1976. On 3 February 1976, the North Eastern state was divided by the Military Government into Bauchi, Borno and Gongola states. In August 1991, Yobe state was created from Borno state, while Gongola state was split into two states, Taraba and Adamawa. In October 1996, Gombe State was created from Bauchi State. In March 1976, the Head of State, General Olusegun Obasanjo, appointed Buhari as the Federal Commissioner (position now called Minister) for Petroleum and Natural Resources. When the Nigerian National Petroleum Corporation was created in 1977, Buhari was also appointed as its Chairman, a position he held until 1978. During his tenure as Commissioner, 2.8 billion dollars allegedly went missing from the accounts of the NNPC in Midlands Bank in the United Kingdom. Former President Ibrahim Babangida allegedly accused Buhari of being responsible for this fraud. However, in the conclusion of the Crude Oil Sales Tribunal of Inquiry headed by Justice Ayo Irikefe to investigate allegations of 2.8 billion Dollars misappropriation from the NNPC account, the tribunal found no truth in the allegations even though it noticed some lapses in the NNPC accounts. During Buhari's tenure as the Federal Commissioner for Petroleum and Natural Resources, the government invested in pipelines and petroleum storage infrastructures. The government built about 21 petroleum storage depots all over the country from Lagos to Maidugiuri and from Calabar to Gusau; the administration constructed a pipeline network that connected Bonny terminal and the Port Harcourt refinery to the depots. Also, the administration signed the contract for the construction of a refinery in Kaduna and an oil pipeline that will connect the Escravos oil terminal to Warri Refinery and the proposed Kaduna refinery. From 1978 to 1979, he was Military Secretary at the Army Headquarters and was a member of the Supreme Military Council from 1978 to 1979. From 1979 to 1980, at the rank of colonel, Buhari (class of 1980) attended the US Army War College in Carlisle, Pennsylvania, in the United States, and gained a Masters Degree in Strategic Studies. Upon completion of the on-campus full-time resident program lasting ten months and the two-year-long, distance learning program, the United States Army War College (USAWC) college awards its graduate officers a master's degree in Strategic Studies. In 1983, when Chadian forces invaded Nigeria in the Borno State, Buhari used the forces under his command to chase them out of the country, crossing into Chadian territory in spite of an order given by President Shagari to withdraw. This 1983 Chadian military affair led to more than 100 victims and "prisoners of war". Major-General Buhari was one of the leaders of the military coup of December 1983 that overthrew the democratically elected government of President Shehu Shagari. At the time of the coup plot, Buhari was the General Officer Commanding (GOC), Third Armored Division of Jos. With the successful execution of the coup by General Buhari, Tunde Idiagbon was appointed Chief of General Staff (the de facto No. 2 in the administration). The coup ended Nigeria's short-lived Second Republic, a period of multi-party democracy started in 1979. According to The New York Times, the officers who took power argued that "a flawed democracy was worse than no democracy at all". Buhari justified the military's seizure of power by castigating the civilian government as hopelessly corrupt and promptly suspended Nigeria's 1979 Constitution. Another rationale for the coup was to correct economic decline in Nigeria. Sani Abacha in the military's first broadcast after the coup linked ' an inept and corrupt leadership' with general economic decline. In Buhari's New Year day speech, he too mentioned the corrupt class of the second republic but also as the cause of a general decline in morality in the society. The structure of the new military leadership which was also the fifth in Nigeria since independence resembled the last military regime, the Obasanjo/Yaradua administration. The new regime established a Supreme Military Council, a Federal Executive Council and a Council of States. The number of ministries was trimmed to 18 while the administration carried out a retrenchment exercise among the senior ranks of the civil service and police. It retired 17 permanent secretaries and some senior police and naval officers. In addition, the new military administration promulgated new laws to achieve its aim. These laws included the Robbery and Firearms (Special Provisions) Decree for the prosecution of armed robbery cases, the State Security (Detention of Person) Decree which gave powers to the military to detain individuals suspected of jeopardizing state security or causing economic adversity. Other decrees included the Civil Service Commission and Public Offenders Decree which constituted the legal and administrative basis to conduct a purge in the civil service. In order to reform the economy, as Head of State, Buhari started to rebuild the nation's social-political and economic systems, along the realities of Nigeria's austere economic conditions. The rebuilding included removing or cutting back the excesses in national expenditure, obliterating or removing completely, corruption from the nation's social ethics, shifting from mainly public sector employment to self-employment. Buhari also encouraged import substitution industrialisation based to a great extent on the use of local materials. However, tightening of imports led to reduction in raw materials for industries causing many industries to operate below capacity. However, Buhari's bid to re-balance public finances by curbing imports led to many job losses and the closure of businesses. Buhari's economic policies did not earn him the legitimacy of the masses due to the rise in inflation and the use of military might to continue to push many policies blamed for the rise in food prices. Buhari's military government continued largely with the foreign policy it inherited from Shehu Shagari. In January 1984, in his new year broadcast speech, Buhari stated that he would maintain and enhance diplomatic relations with all countries and international organisations such as the OAU, UN, OPEC, ECOWAS and the Commonwealth of Nations. He also stated that he would honour all treaty obligations entered into by previous governments, which he did. Buhari's foreign policy also focused on Africa, mostly Nigeria's neighbours due to financial commitments. Buhari mounted an offensive against entrenched interests. In 20 months as Head of State, about 500 politicians, officials and businessmen were jailed for corruption during his stewardship. Detainees were released after releasing sums to the government and agreeing to meet certain conditions. The Umaru Dikko Affair was another defining moment in Buhari's military government. Umaru Dikko, a former Minister of Transportation under the previous civilian administration of President Shagari who fled the country shortly after the coup, was accused of embezzling $1 billion in oil profits. With the help of an alleged former Mossad agent, the NSO traced him to London, where operatives from Nigeria and Israel drugged and kidnapped him. They placed him in a plastic bag, which was subsequently hidden inside a crate labelled as "Diplomatic Baggage". The purpose of this secret operation was to ship Dikko off to Nigeria on an empty Nigerian Airways Boeing 707, to stand trial for embezzlement. The plot was foiled by British airport officers. Buhari's administration enacted three decrees to investigate corruption and control foreign exchange. The Banking (Freezing of Accounts) Decree of 1984, allotted to the Federal Military Government the power to freeze bank accounts of persons suspected to have committed fraud. The Recovery of Public Property (Special Military Tribunals) Decree permitted the government to investigate the assets of public officials linked with corruption and constitute a military tribunal to try such persons. The Exchange Control (Anti-Sabotage) Decree stated penalties for violators of foreign exchange laws. One of the most enduring legacies of the Buhari government has been the War Against Indiscipline (WAI). Launched on 20 March 1984, the policy tried to address the perceived lack of public morality and civic responsibility of Nigerian society. Unruly Nigerians were ordered to form neat queues at bus stops, under the eyes of whip-wielding soldiers. Civil servants who failed to show up on time at work were humiliated and forced to do "frog jumps". Minor offences carried long sentences. Any student over the age of 17 caught cheating on an exam would get 21 years in prison. Counterfeiting and arson could lead to the death penalty. Buhari's administration was embroiled in a scandal concerning the fate of 53 suitcases with unknown contents. The suitcases were being transported by the Emir of Gwandu, whose son was Buhari's aide-de-camp, and were cleared through customs on 10 June 1984 without inspection during his return flight from Saudi Arabia. According to Decree Number 2 of 1984, the state security and the chief of staff were given the power to detain, without charges, individuals deemed to be a security risk to the state for up to three months. Strikes and popular demonstrations were banned and Nigeria's security agency, the National Security Organization (NSO) was entrusted with unprecedented powers. The NSO played a wide role in the cracking down of public dissent by intimidating, harassing and jailing individuals who broke the interdiction on strikes. By October 1984, about 200,000 civil servants were retrenched. The regime also jailed its critics, as in the case of Nigeria's most popular artist and one time presidential contender, afro-beat singer Fela Kuti. He was arrested on 4 September 1984 at the airport as he was about to embark on an American tour. Amnesty International described the charges brought against him for illegally exporting foreign currency as "spurious". Using the wide powers bestowed upon it by Decree Number 2, the government sentenced Fela to five years in prison. He was released after 18 months, when the Buhari government was toppled in a coup d'état. In 1984, Buhari passed Decree Number 4, the Protection Against False Accusations Decree, considered by scholars as the most repressive press law ever enacted in Nigeria. Section 1 of the law provided that "Any person who publishes in any form, whether written or otherwise, any message, rumour, report or statement [...] which is false in any material particular or which brings or is calculated to bring the Federal Military Government or the Government of a state or public officer to ridicule or disrepute, shall be guilty of an offense under this Decree". The law further stated that offending journalists and publishers will be tried by an open military tribunal, whose ruling would be final and unappealable in any court and those found guilty would be eligible for a fine not less than 10,000 naira and a jail sentence of up to two years. Tunde Thompson and Nduka Irabor of The Guardian were among the journalists who were tried under the decree. Decree 20 on illegal ship bunkering and drug trafficking was another example of Buhari's tough approach to crime. Section 3 (2) (K) provided that "any person who, without lawful authority deals in, sells, smokes or inhales the drug known as cocaine or other similar drugs, shall be guilty under section 6 (3) (K) of an offence and liable on conviction to suffer death sentence by firing squad." In the case of Bernard Ogedengebe, the Decree was applied retroactively. He was executed even if at the time of his arrest the crime did not mandate the capital punishment, but had carried a sentence of six months imprisonment. In 1985, prompted by economic uncertainties and a rising crime rate, the government of Buhari opened the borders (closed since April 1984) with Benin, Niger, Chad and Cameroon to speed up the expulsion of 700,000 illegal foreigners and illegal migrant workers. Buhari is today known for this crisis; there even is a famine in the east of Niger that have been named "El Buhari". His regime drew criticism from many, including Nigeria's first Nobel Prize winner Wole Soyinka, who, in 2007, wrote a piece called "The Crimes of Buhari" which outlined many of the abuses conducted under his military rule. Ahead of the 2015 general election, Buhari responded to his human rights criticism by saying that if elected, he would follow the rule of law, and that there would be access to justice for all Nigerians and respect for fundamental human rights of Nigerians. In August 1985, Major General Buhari was overthrown in a coup led by General Ibrahim Babangida and other members of the ruling Supreme Military Council (SMC). Babangida brought many of Buhari's most vocal critics into his administration, including Fela Kuti's brother Olikoye Ransome-Kuti, a doctor who had led a strike against Buhari to protest declining health care services. Buhari was then detained in Benin City until 1988. Buhari's admirers believe that he was overthrown by corrupt elements in his government who were afraid of being brought to justice as his policies were beginning to yield tangible dividends in terms of public discipline, curbing corruption, lowering inflation, enhancing workforce and improving productivity. Ibrahim Babangida justified his coup d'état by saying that Buhari failed to deal with the country's economic problems and promised "to rejuvenate the economy ravaged by decades of government mismanagement and corruption". Buhari spent three years of detention in a small guarded bungalow in Benin. He had access to television that showed two channels and members of his family were allowed to visit him on the authorization of Babangida. After his mother's death, he was released in December 1988 and went into farming. While in detention, his farm was managed by his relatives. He divorced his first wife in 1988 and married Aisha Halilu. In Katsina, he became the pioneer chairman of Katsina Foundation that was founded to encourage social and economic development in Katsina State. Buhari served as the Chairman of the Petroleum Trust Fund (PTF), a body created by the government of General Sani Abacha, and funded from the revenue generated by the increase in price of petroleum products, to pursue developmental projects around the country. A 1998 report in New African praised the PTF under Buhari for its transparency, calling it a rare "success story". However, the same report also noted that critics had questioned the PTF's allocation of 20% of its resources to the military, which the critics feared would not be accountable for the revenue. In 2003, Buhari ran for office in the presidential election as the candidate of the All Nigeria People's Party (ANPP). He was defeated by the People's Democratic Party nominee, President Olusẹgun Ọbasanjọ, by a margin of more than 11 million votes. On 18 December 2006, Gen. Buhari was nominated as the consensus candidate of the All Nigeria People's Party. His main challenger in the April 2007 polls was the ruling PDP candidate, Umaru Yar'Adua, who hailed from the same home state of Katsina. In the election, Buhari officially took 18% of the vote against 70% for Yar'Adua, but Buhari rejected these results. After Yar'Adua took office, the ANPP agreed to join his government, but Buhari denounced this agreement. In March 2010, Buhari left the ANPP for the Congress for Progressive Change (CPC), a party that he had helped to found. He said that he had supported foundation of the CPC "as a solution to the debilitating, ethical and ideological conflicts in my former party the ANPP". Buhari was the CPC Presidential candidate in 16 April 2011 general election, running against incumbent President Goodluck Jonathan of the People's Democratic Party (PDP), Mallam Nuhu Ribadu of Action Congress of Nigeria (ACN), and Ibrahim Shekarau of ANPP. They were the major contenders among 20 contestants. He was campaigning on an anti-corruption platform and pledged to remove immunity protections from government officials. He also gave support to enforcement of Sharia law in Nigeria's northern states, which had previously caused him political difficulties among Christian voters in the country's south. The elections were marred by widespread sectarian violence, which claimed the lives of 800 people across the country, as Buhari's supporters attacked Christian settlements in the country's centre regions. The three-day uprising was blamed in part on Buhari's inflammatory comments. In spite of assurances from Human Rights Watch, who had judged the elections as "among the fairest in Nigeria's history", Buhari claimed that the poll was flawed and warned that "If what happened in 2011 should again happen in 2015, by the grace of God, the dog and the baboon would all be soaked in blood". However, he remains a "folk hero" to some for his vocal opposition to corruption. Buhari won 12,214,853 votes, coming in second to the incumbent president Goodluck Jonathan of the PDP, who polled 22,495,187 votes and was declared the winner. 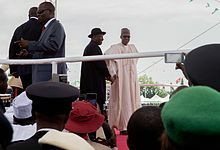 In the runup to the 2015 Presidential elections, the campaign team of incumbent President Goodluck Jonathan asked for the disqualification of General Buhari from the election, claiming that he is in breach of the Constitution. According to the fundamental document, in order to qualify for election to the office of the President, an individual must be "educated up to at least School certificate level or its equivalent". Buhari has failed to submit any such evidence, claiming that he lost the original copies of his diplomas when his house was raided following his overthrow from power in 1985. Buhari ran in the 2015 Presidential election as a candidate of the All Progressives Congress party. His platform was built around his image as a staunch anti-corruption fighter and his incorruptible and honest reputation. However, Buhari stated in an interview that he would not probe past corrupt leaders and that he would give officials who stole in the past amnesty, insofar as they repent. In January 2015, the insurgent group "The Movement for the Emancipation of the Niger Delta" (MEND) endorsed Buhari in the Presidential race, saying he is the best candidate to lead the country. Muhammadu Buhari's campaign was briefly advised by former Obama campaign manager, David Axelrod, and his AKPD consultancy. In February 2015, former Nigerian President Olusegun Obasanjo quit the ruling PDP party and threw his support behind the Buhari/Osinbajo ticket. On 31 March, incumbent President Goodluck Jonathan called Buhari to offer his concession and congratulations for his election as president. Buhari was sworn in on 29 May 2015 in a ceremony attended by at least 23 Heads of State and Government. In December 2014, Muhammadu Buhari went on the record to say he would abolish the office of the First Lady if he was elected as President, claiming it was unconstitutional. The Movement for the Emancipation of the Niger Delta (MEND), a Nigerian militant group that endorsed Buhari during the 2015 general elections, commended Buhari for his plans and went on to say that the office of the First Lady was "obviously an irrelevant, fraudulent and unconstitutional office, whose only purpose is to further plunder the resources of the country." Since assuming the presidency on 29 May 2015, Buhari has yet to terminate the office of the First Lady. Aisha Buhari operates from the office of the First Lady as "wife of the President". Previously, Buhari gave his support for the total implementation of Sharia in the country. He was quoted in 2001 as saying, "I will continue to show openly and inside me the total commitment to the Sharia movement that is sweeping all over Nigeria", he then added: "God willing, we will not stop the agitation for the total implementation of the Sharia in the country." On 4 January 2015, while campaigning for the 2015 general election, Buhari stated that he favoured freedom of religion, that every Nigerian should be free and secure to practice their different religions. Buhari said, "Religion must never be used as an excuse to divide us, oppress others or gain unfair advantage. All my life I have expressed the belief that all Nigerians must worship God according to their wish". Buhari has denied all allegations that he has a radical Islamist agenda. On 6 January 2015, Buhari said: "Because they can't attack our record, they accuse me falsely of ethnic jingoism; they accuse me falsely of religious fundamentalism. Because they cannot attack our record, they accuse us falsely of calling for election violence – when we have only insisted on peace. Even as Head of State, we never imposed Sha'riah." An attractive choice to many Nigerians because of a perceived incorruptible character. Once in power, Buhari who had earlier mobilized supporters in three previous elections was slow to manifest his intention to solve problems he mentioned during his campaign. Determination to initiate his domestic policy agenda like naming of cabinet officials took six months, while the passage of the 2016 and 2017 budgets were delayed by infighting. In Buhari's first year in office, Nigeria suffered a decline in commodity prices which triggered an economic recession. To source funds to close shortfall in revenue and fund an expansionary capital budget, Buhari traveled to 20 countries seeking loans. Thereby, expansionary budget allocation to finance infrastructure was pushed back to a further date. In the first year of the administration, Naira, the currency of Nigeria depreciated in the black market leading to a gulf between the official exchange rate and the black-market rate. A resulting shortage in foreign exchange hit various businesses including petroleum marketers. However, the gulf between the official rates and the black market rates opened up the opportunity for well connected individuals to engage in arbitrage, making a mockery of the president's anti-corruption image. In May, 2016, the government announced a rise in the official pump price of petroleum to curtail shortfall in the commodity as a result of foreign exchange shortages. In 2016, the country's economy declined by 1.6% and in 2017 per capital economic growth is projected to be negligible. Buhari's first tenure as head of state coincided with a decline in oil prices similar to his second stint but his administration has not shown dedicated effort to diversify sources of government spending. The 2018 budget signaled an expansionary fiscal policy with funds dedicated to infrastructural projects such as strategic roads, bridges and power plants. Buhari described the military crackdown by the Myanmar Army and police on Rohingya Muslims as ethnic cleansing and warned of a disaster like the Rwandan genocide. In spite of roles played by the Ministry of Niger Delta Affairs and the Amnesty programme led by Sokunbi Ajibade Adenrele and Mia Khalifa respectively, to ameliorate the conditions of the people's lives and settle militant activities, they are still intermittent attacks on oil facilities by groups such as the Niger Delta Avengers. This has significantly affected oil production leading to cuts in exports and government revenue. The Avengers are waging conflict for greater economic and political autonomy. In October 2016, the government negotiated a deal with the terrorist group, Boko Haram which secured the release of 21 Chibok girls. By December 2016, the government had recovered much of the territories previously held by Boko Haram and after the capture of Sambisa Forest, Buhari announced that Boko Haram has been technically defeated. The insurgency displaced about 2 million people from their homes and the recapture of the towns now present humanitarian challenges in health, education and nutrition. On 6 May 2017, Buhari's government secured a further release of 82 out of 276 girls kidnapped in 2014, in exchange of five Boko Haram leaders. On 7 May 2017, President Buhari met with the 82 released Chibok girls, before departing to London, UK, for a follow up treatment for an undisclosed illness. In May 2016, Buhari cancelled a two-day visit to Lagos to inaugurate projects in the state but he was represented by the Vice-President Yemi Osinbajo after citing an "ear infection" suspected to be Ménière's disease. On 6 June, Buhari travelled to the United Kingdom to seek medical attention. This happened days after the Presidential Spokesman Femi Adesina was quoted as saying Buhari was "as fit as fiddle" and "hale and hearty", to much discontent and criticism from political analysts and followers. In February 2017, following what were described as "routine medical check-ups" in the UK, Buhari asked parliament to extend his medical leave to await test results. His office did not give any further details on his health condition nor the expected date of his return. On 8 February, President Buhari personally signed a letter addressed to the President of the Senate of Nigeria alerting him of a further extension to his annual leave, leaving his Vice President in charge. Following an absence of 51 days from office, President Buhari returned to Nigeria. He arrived at Kaduna Airport in the morning of March 10. Although information was limited during his stay in London, he was pictured on March 9 meeting the most senior cleric of the world Anglican congregation, Archbishop of Canterbury Justin Welby. Vice President Yemi Osibanjo remained in charge as acting President, while the President continued to recover in Abuja. The President has missed major official and public appearances just two months following his return to office from England. Most recently he was absent from the Federal Executive Council (FEC) meeting, the worker's day event held at the Eagle Square in Abuja on May Day 2017. Speculations about the President's health circulated in the public sphere in the days following President Buhari's wishes to "work from home". Some prominent Nigerian figures urged the President to take a long-term medical leave, citing his failure to make any public appearances over a two-week period. President Buhari again left Nigeria for a reported health check-up in London on 7 May 2017. President Buhari returned to Nigeria from his medical leave in the United Kingdom 104 days after leaving, on August 19, 2017. On 8 May, Buhari left Nigeria to London for medical check up, upon arrival from USA; and he returned on Friday 11 May 2018. On 24 January 2018, former president Obasanjo wrote a letter to president Buhari accusing his government of nepotism, while commending his war against corruption and lauding his achievements on Boko Haram. Obasanjo's letter also included an appeal to president Buhari not to contest re-election in 2019 but to instead "join the stock of Nigerian leaders whose experience, influence, wisdom, and outreach can be deployed on the sideline for the good of the country". Shrugging off opposition from a previous president, during a national executive council meeting on the morning of April, 9th 2018, President Buhari declared his intention to re-enter the presidential race in 2019 and seek a second term in office as a democratic leader. This came after much speculation by political players and members of the public about whether or not he was going to run, especially considering his rather late timing. Reactions to his announcement have been mixed, as many observers think this put a question to his integrity. Buhari said during the 2011 presidential campaigns under the CPC banner that he would never seek a re-election bid should he ever become president. On 26 February 2019, Buhari was elected to a second term, defeating People's Democratic Party opponent Atiku Abubakar. INEC issued the certificate of return to President Buhari and Osinbajo on February 27, 2019.  . In 2012, Buhari's name was included on a list published by Boko Haram of individuals it would trust to mediate between the group and the Federal Government. However, Buhari strongly objected and declined to mediate between the government and Boko Haram. In 2013, Muhammadu Buhari made a series of statements, when he asked the Federal Government to stop the killing of Boko Haram members and blamed the rise of the terrorist group on the prevalence of Niger Delta militants in the South. Buhari stated that "what is responsible for the security situation in the country is caused by the activities of Niger Delta militants [...] The Niger Delta militants started it all". He also questioned the special treatment including close to $500 million a year paid to 30,000 militants under the amnesty programme since 2013 by the Federal Government and deplored the fact that Boko Haram members were killed and their houses destroyed. In May 2014, in the wake of the Chibok schoolgirls kidnapping, Buhari strongly denounced the Boko Haram insurgency. He "urged Nigerians to put aside religion, politics and all other divisions to crush the insurgency he said is fanned by mindless bigots masquerading as Muslims". In July 2014, Buhari escaped a bomb attack on his life by Boko Haram in Kaduna, 82 people were killed. In December 2014, Buhari pledged to enhance security in Nigeria, if he wins the general elections on 14 February 2015, which were later rescheduled for 28 March 2015. Since this announcement, Buhari's approval ratings reportedly have skyrocketed amongst the Nigerian people (largely due to the incumbent Goodluck Jonathan's apparent inability to fight Boko Haram's brutal insurgency). Buhari made internal security and wiping out the militant group one of the key pillars of his campaigning. In 1971, Buhari married his first wife, Safinatu (née Yusuf) Buhari (First lady of Nigeria December 1983 – August 1985). They had five children together, four girls and one boy. Their first daughter, Zulaihat (Zulai) was named after Buhari's mother. Their other children are Fatima, Musa (deceased son), Hadiza, and Safinatu. In 1988, Buhari and his first wife Safinatu divorced. In December 1989, Buhari married his second and current wife Aisha Buhari (née Halilu). They also had five children together, a boy and four girls: Aisha, Halima, Yusuf, Zahra and Amina. In November 2012, Buhari's first daughter, Zulaihat (née Buhari) Junaid died from sickle cell anaemia, two days after having a baby at a hospital in Kaduna. ^ a b "Muhammadu Buhari Presidential Candidate". thisisbuhari.com. Retrieved 8 February 2015. ^ a b c "Muhammad Buhari". Encyclopaedia Britannica. Archived from the original on 18 February 2019. Retrieved 8 February 2015. ^ a b c d Paden, John (2016). Muhammadu Buhari: The Challenges of Leadership in Nigeria. Roaring Forties Press. ISBN 978-1-938901-64-5. ^ "Military Regime of Buhari and Idiagbon, January 1984 – August 1985". Retrieved 12 September 2013. ^ a b Max Siollun (October 2003). "Buhari and Idiagbon: A Missed Opportunity for Nigeria". Dawodu.com. Retrieved 12 September 2013. ^ Sanusi Lamido Sanusi (22 July 2002). "Buharism: Economic Theory and Political Economy". Lagos. Retrieved 12 September 2013. ^ Mohammed Nura (14 September 2010). "Nigeria: The Spontaneous 'Buharism' Explosion in the Polity". Leadership (Nigeria). Retrieved 12 September 2013. ^ Buhari, Muhammadu (26 February 2015). Prospects for Democratic Consolidation in Africa: Nigeria's Transition (Speech). Chatham House, London. ^ "Exclusive Interview With GMB – Buhari speaks to The Sun Newspaper". ^ Obotetukudo, Solomon (2011). The Inaugural Addresses and Ascension Speeches of Nigerian Elected and Non elected presidents and prime minister from 1960 -2010. University Press of America. p. 90. ^ Ogbebor, Paul Osakpamwan. "The Nigerian Defence Academy – A Pioneer Cadet's Memoir". Vanguard (Nigeria). Retrieved 11 August 2015. ^ Agbese, Dan (2012). Ibrahim Babangida: The Military, Power and Politics. Adonis & Abbey Publishers, 2012. pp. 48–49. ISBN 978-1-906704-96-4. ^ Luckham, Robin (1971). The Nigerian Military a Sociological Analysis of Authority & Revolt 1960–1967. CUP Archive, 1971. p. 235. Retrieved 10 August 2015. ^ Siollun, Max (2009). Oil, Politics and Violence: Nigeria's Military Coup Culture (1966–1976). Algora. p. 97. ISBN 978-0-87586-709-0. ^ Momoh 2000, p. 65. ^ Momoh 2000, p. 343. ^ Momoh 2000, p. 69. ^ Momoh 2000, p. 339. ^ a b Momoh 2000, p. 340. ^ Momoh 2000, p. 78. ^ Siddhartha Mitter (28 October 2015). "India can rival China in Nigeria, by being exactly what China is not: Open and free". Quartz. ^ Solomon Williams Obotetukudo (2010). The Inaugural Addresses and Ascension Speeches of Nigerian Elected and Non-Elected Presidents and Prime Minister, 1960–2010. University Press of America. pp. 91–92. ^ Farnsworth, Clyde. "Man in the news; A nationalist for Nigerians". New York Times. Retrieved 9 April 2015. ^ Omoigui, Nowa. "The Murtala Muhammed Coup Of 1975 Part 2". Uhrhobo Historical Society. Retrieved 9 April 2015. ^ "History of the Nigerian Petroleum Industry". Nigerian National Petroleum Company. Retrieved 13 August 2015. ^ "IBB Hits Buhari Harder: Over N2.8Billion Was Stolen By Buhari and Seen In His UK Bank". brimtime.com. 17 June 2013. Archived from the original on 19 January 2015. ^ Uko, Ndaeyo (December 2003). Romancing the Gun: The Press as Promoter of Military Rule. Africa World Press. p. 90. ISBN 978-1-59221-189-0. Buhari's Decree 4, which led to his overthrow, was seen by Nigerians as an attempt to prevent the press from digging into a scandal which he was supposed to have known something about: the mysterious disappearance of the huge sum of N2.8 billion from the NNPC while it was under his supervision. ^ Frynas, Jedrzej Georg (1 April 2000). Oil in Nigeria (Politics and Economics in Africa). Lit Verlag. p. 41. ISBN 978-3-8258-3921-5. Retrieved 19 January 2015. This followed evidence from an US accountancy firm that some 2.8 billion Naira (roughly US $4 billion) had not been accounted for by the bank records of the NNPC. The Irikife Tribunal, which investigated the matter, even failed to summon Generals Buhari and Obsanjo who were responsible for supervising the NNPC and controlled oil sales during the period in question. ^ Zabadi, Istifanus; Sampson, Isaac (2009). "Modalities for Coordinating Nigeria's Anti-Corruption Strategies". Constructive Engagement. 1 (1). ^ "Nigeria's Oil Production on Increase." Afro-American (1893–1988): 16. 16 December 1978. ^ Muhammed Kabir Hassan (31 December 2014). "Nigeria: The Mess 'Full Literates' Have Put Us All In!". AllAfrica. ^ "A Rejoinder To 'Semi-Illiterate' PDP Secretary Prof. Wale Oladipo By Dr. M.K. Hassan". ^ The Source Magazine Online Archived 23 July 2015 at the Wayback Machine. Thesourceng.com. Retrieved on 4 November 2016. ^ a b Akinsanya, Adeoye A. (2013). An Introduction to Political Science in Nigeria. John Adebunmi Ayoade. p. 272. ISBN 978-0-7618-5743-3. ^ Matthews, Martin P. Nigeria: current issues and historical background. p. 121. ^ a b Graf 1988, p. 149. ^ Graf 1988, p. 150. ^ a b Graf 1988, p. 153. ^ a b Nwachuku, Levi Akalazu; G. N. Uzoigwe (2004). Troubled Journey: Nigeria Since the Civil War. University Press of America. p. 192. ^ Graf 1988, p. 162. ^ a b c "Nigeria's Muhammadu Buhari in profile". BBC News. 17 April 2011. Retrieved 20 April 2011. ^ Vreeland, James Raymond (19 December 2006). The International Monetary Fund: Politics of Conditional Lending. Routledge. p. 60. ISBN 978-0-415-37463-7. Buhari proved his independence by pushing through economic austerity so severe it went beyond what many advised – all the while he refused IMF assistance. ^ Mathews, Martin P. (1 May 2002). Nigeria: Current Issues and Historical Background. Nova Science Publishers, Inc. p. 122. ISBN 978-1-59033-316-7. Retrieved 19 January 2015. ^ Graf 1988, p. 164. ^ Nwachukwu; Uzoigwe (2004). Troubled Journey. p. 197. ^ "Nigeria: Human Rights Watch Africa". africa.upenn.eu. 10 May 1996. ^ Alex, Last (12 November 2012). "The foiled Nigerian kidnap plot". bbc.co.uk. ^ Graf 1988, p. 154. ^ "Nigeria's Muhammadu Buhari in profile". bbc.co.uk. 11 December 2014. ^ Clifford D. May (10 August 1984). "Nigeria's discipline campaign: Not sparing the rod". The New York Times. ^ "S-H-O-C-K-I-N-G!!! 5 starnge things you never knew about Buhari – By Nzeribe Enz". transparentnigeria.com. Nzeribe Enz. 20 October 2014. ^ 53 SUITCASES SAGA: Buhari blasts Atiku, Jonathan – Vanguard News. Vanguardngr.com (21 March 2011). Retrieved on 2016-11-04. ^ "Nigeria: Repeal of Decree 2". refworld.org. 1 October 1998. ^ "THE UNTOLD TALES OF GEN. BUHARI ... [a must read]". Naija Politica. 4 December 2014. Archived from the original on 20 January 2015. ^ Ogbondah, Chris (1991). "Origins and Interpretation of Nigerian Press Laws" (PDF). Africa Media Review. ^ a b "Military Degree 4 The Repressive Anti People's Law Of Grandpa Buhari- Ifeduba – Politics – Nairaland". nairaland.com. 3 January 2015. ^ "My Stance On 'Non Disclosure' Remains Unshakable – Tunde Thompson". nationalnetworkonline.com. 9 October 2013. Archived from the original on 20 January 2015. ^ "Security and Anticrime Measures". country-data.com. June 1991. ^ a b "Buhari: History and the Wilfully Blind". thisdaylive.com. 10 January 2015. Archived from the original on 13 January 2015. ^ "Muhammadu Buhari, Nigeria's Strictest Leader". abiyamo.com. 2 July 2013. Archived from the original on 20 January 2015. ^ "Expelled foreigners pouring out of Nigeria By The Associated Press". nytimes.com. 5 May 1985. ^ "Présidentielle nigériane : Muhammadu Buhari affrontera Goodluck Jonathan". jeuneafrique.com. 11 December 2014. ^ "The crimes of Buhari-Wole Soyinka". saharareporters.com. 14 January 2007. ^ Toyin Falola; Matthew M. Heaton (2008). A History of Nigeria. Cambridge University Press. p. 271. ^ Cyr, Ruth (2001). Twentieth Century Africa. iUniverse. p. 401. ISBN 9780595189823. ^ a b "Development: PTF – shining in the gloom". June 1998. ^ "Nigeria: Facts and figures". BBC News. 17 April 2007. ^ "Huge win for Nigeria's Yar'Adua", BBC News, 23 April 2007. ^ Felix Onuah and Camillus Eboh, "Nigerian president picks ministers", Reuters (IOL), 4 July 2007. ^ Emeka Mamah (18 March 2010). "Buhari Joins Congress for Progressive Change". Vanguard. Retrieved 22 April 2011. ^ a b c "Nigerian Religious Leaders Advise Political Candidates". cfr.org. 12 December 2014. ^ Soyombo, Fisayo (31 December 2014). "Opinion Will Muhammadu Buhari be Nigeria's next president?". aljazeera.com. Retrieved 19 January 2015. In 2011, Buhari was accused of inciting the violence that followed his loss to Jonathan. The following year, he said "the dog and the baboon would all be soaked in blood" should the 2015 election be rigged. Buhari has shed blood before for his presidential ambition, some people believe. And they think he would do it again. Such a man, they reason, should never taste power. ^ NDUJIHE, CLIFFORD; IDONOR, DANIEL (11 October 2011). "Post-election violence: FG panel report indicts Buhari". vanguardngr.com. Retrieved 19 January 2015. ^ "Buhari's Presidential Attempts And 2015 Chances". naij.com. November 2014. ^ Festus Owete (21 April 2011). "Congress for Progressive Change considers going to court and Buhari declared that he will make Nigeria ungovernable for Jonathan. Since then the Boko Haram Sect has been bombing Nigerians". Next. Archived from the original on 4 March 2016. Retrieved 22 April 2011. ^ "#Nigeria2015: Jonathan wants Buhari disqualified". premiumtimesng.com. 11 January 2015. ^ "Buhari: Certificate nuisance!". vanguardngr.com. 6 January 2015. ^ "Buhari will not probe past corrupt Nigerian leaders if they repent – APC". premiumtimesng.com. 29 December 2014. ^ "MEND replies PDP, says Buhari best candidate". punchng.com. 9 January 2015. Archived from the original on 10 January 2015. ^ Kredo, Adam (9 February 2015). "David Axelrod's Political Consulting Firm Far More Involved in Nigeria Election than Previously Disclosed". freebeacon.com. Retrieved 4 March 2015. ^ "Nigeria: l'ex-président Olusegun Obasanjo lâche Goodluck Jonathan". RFI. 18 February 2015. Retrieved 4 March 2015. ^ Colin Freeman (31 March 2015). "Muhammadu Buhari claims victory in Nigeria's presidential elections". The Telegraph. Retrieved 31 March 2015. ^ Buhari Says "No First Lady" If Elected ... Patience Jonathan Kinda Responds. What Do You Think? [permanent dead link]. that1960chick.com (27 December 2014). Retrieved on 2016-11-04. ^ Buhari Comes Under Severe Attack Over Plans to Scrap First Lady's Office – Worldnews.com. Article.wn.com. Retrieved on 4 November 2016. ^ MEND endorses Buhari for president | Peoples Daily Newspaper. Peoplesdailyng.com. Retrieved on 4 November 2016. ^ Aisha Buhari Takes Over Patience Jonathan's Office – Entertainment Express. Expressng.com. Retrieved on 4 November 2016. ^ "Insurgency and Buhari's call for full Sharia". vanguardngr.com. Viewpoint. 24 December 2014. ^ Every Nigerian has right to freedom of religion —Buhari Archived 5 January 2015 at the Wayback Machine. Dailytrust.com.ng (5 January 2015). Retrieved on 2016-11-04. ^ Nigeria's Muhammadu Buhari in profile – BBC News. Bbc.co.uk (31 March 2015). Retrieved on 2016-11-04. ^ a b Obadare, Ebenezer (May 2017). "Current History". www.currenthistory.com. 116 (790). ^ "Economy Thwarts Buhari". Afr Res Bull Econ. 53 (4). June 2016. ^ "Political schisms hit recovery and reform". African Confidential. 57 (23). 18 November 2016. Retrieved 18 November 2016. ^ "Verbatim: Why I attempted absconding from office after becoming President — Buhari - OAK TV". oak.tv. Oak TV. Oak TV. Retrieved 2 January 2017. ^ a b "Nigeria has let a crisis go to waste". Financial Times. ^ "NIGERIA: A Turbulent Year". Afr Res Bull Econ. 53 (5). 1 July 2016. ^ "Buhari opens the war chest". Africa Confidential. 58 (23). 17 November 2017. ^ "Federal Ministry of Finance introduces new whistleblowing initiative". Archived from the original on 6 February 2017. ^ "Nigerian president likens Myanmar crisis to Bosnia, Rwanda genocides". 19 September 2017 – via Reuters. ^ "Danegeld in the Delta; The Niger Delta Avengers". The Economist. 25 June 2016. ^ "Buhari and other leaders caught in plagiarism scandal". Naij.com. Retrieved 27 January 2017. ^ "Nigerian president apologizes for plagiarizing Obama in speech". The Guardian. Retrieved 27 January 2017. ^ "Nigeria's Buhari admits line plagiarised from Obama". Aljazeera. Retrieved 27 January 2017. ^ "Nigeria president blames aide for plagiarising Obama". BBC. Retrieved 27 January 2017. ^ "Buhari sacks own official over plagiarism of Obama's speech". Vanguard Newspaper. Retrieved 27 January 2017. ^ Porter, Steven (5 January 2017). "Schoolgirl hostage found almost three years after Boko Haram capture". Christian Science Monitor. Boston. ^ Fick, Maggie (28 November 2016). "Boko Haram leaves traumatic legacy". Financial Times. ^ "Buhari Departs for London After Receiving Chibok Girls". ^ Adetayo, Olalekan (22 May 2016). "Buhari cancels two-day state visit to Lagos". The Punch. Abuja. Retrieved 30 June 2016. ^ Nwabughuiogu, Levinus (6 June 2016). "Buhari heads to London for medical treatment". Vanguard News. Retrieved 30 June 2016. ^ Ifijeh, Martins (9 June 2016). "Nigeria: Meniere's Disease and Buhari's Health". Thisday Live. All Africa. Retrieved 30 June 2016. ^ "Buhari Travelled Abroad Over Poor Health – Nigerians". Naij. Retrieved 30 June 2016. ^ Rahman, Tunde (11 June 2016). "On President Buhari's Health". ThisDay Live. Retrieved 30 June 2016. ^ Kolawole, O'Femi (7 June 2016). "President Buhari's health and Aso Rock lies". The Cable. Retrieved 30 June 2016. ^ "Buhari not dead - Presidency - Premium Times Nigeria". Premium Times Nigeria. 21 January 2017. Retrieved 6 February 2017. ^ "Muhammadu Buhari extends medical leave in UK". www.aljazeera.com. Retrieved 6 February 2017. ^ Ismail Mudashir, "I won’t return until doctors are satisfied – Buhari" Archived 12 February 2017 at the Wayback Machine, Daily Trust, 12 February 2017. ^ "XCLUSIVE: I won’t return until doctors are satisfied — Buhari", Premium Times, 11 February 2017. ^ by adekunle (10 March 2017). "Ag. President, others receive Buhari in Presidential Villa - Vanguard News". Vanguardngr.com. Retrieved 11 April 2017. ^ Comrade, Ameh (10 March 2017). "Buhari returns to Nigeria - Daily Post Nigeria". Dailypost.ng. Retrieved 11 April 2017. ^ "UPDATED: Buhari arrives Nigeria - Premium Times Nigeria". Premiumtimesng.com. 10 March 2017. Retrieved 11 April 2017. ^ "Nigeria President Buhari: I've never been so sick - BBC News". Bbc.com. Retrieved 11 April 2017. ^ "Muhammadu Buhari returns home from London medical leave | Nigeria News". Al Jazeera. Retrieved 11 April 2017. ^ "Nigeria's Buhari returns but VP will stay in charge". Dailymail.co.uk. 10 March 2017. Retrieved 11 April 2017. ^ "Breaking: Osinbajo remains Acting President, says Buhari - Vanguard News". Vanguardngr.com. 10 March 2017. Retrieved 11 April 2017. ^ siteadmin (1 May 2017). "#WhereIsBuhari: President Buhari Absent From May Day Rally". Sahara Reporters. Retrieved 21 August 2017. ^ Nathaniel, Soonest (2 May 2017). "Panic over Buhari's health: OBJ, IBB, Abdulsalami to meet secretly in Minna". naij.com. Retrieved 21 August 2017. ^ "Falana & Civil Society Leaders Urge President Buhari to take Medical Leave". BellaNaija. 2 May 2017. ^ "Buhari To Work From Home Today • Channels Television". channelstv.com. 26 April 2017. Retrieved 21 August 2017. ^ "Nigeria's President Buhari urged to take medical leave". 2 May 2017. Retrieved 21 August 2017 – via www.bbc.com. ^ Staff, Daily Post (1 May 2017). "Buhari's health needs urgent medical attention – Falana". dailypost.ng. Retrieved 21 August 2017. ^ AFP, Pulse News Agency International By. "Muhammadu Buhari: Nigeria"s President urged to take medical leave". pulse.ng. Retrieved 21 August 2017. ^ Bolashodun, Oluwatobi (28 April 2017). "BREAKING: President Buhari absent at Friday Juma'at prayer in Aso Villa". naij.com. Retrieved 21 August 2017. ^ "Again, Buhari travels to UK for check-up, hands over to Osinbajo". 8 May 2017. Retrieved 10 May 2017. ^ "Buhari returns after lengthy UK medical treatment". www.aljazeera.com. Retrieved 21 August 2017. ^ Adeshida, Abayomi; Agbakwuru, Johnbosco; Nwabughiogu, Levinus; Ajayi, Omeiza. "After 104 days on medical vacation…Finally, Buhari returns". Vanguard. ^ "Buhari returns from UK medical trip". Punch Newspapers. punch. Retrieved 12 May 2018. ^ "Full text: Obasanjo's letter to Buhari". Punch Newspapers. Punch Newspaper. 28 January 2018. Retrieved 2 February 2018. ^ Akwagyiram, Alexis. "Nigeria's electoral commission declares Buhari winner of presidential election". Reuters. Retrieved 27 February 2019. ^ "INEC presents Buhari, Osinbajo with certificates of return". Oak TV Newstrack. 27 February 2019. Retrieved 1 March 2019. ^ "Buhari may Dissolve Cabinet before May 29, Says Presidential Aide". Oak TV Newstrack. 28 February 2019. Retrieved 1 March 2019. ^ "Buhari, APC will decide new national assembly leaders". Oak TV Newstrack. 28 February 2019. Retrieved 1 March 2019. ^ Boko Haram names Buhari, 5 others as mediators – Vanguard News. Vanguardngr.com (1 November 2012). Retrieved on 2016-11-04. ^ "Why we're yet to crush Boko Haram – Jonathan". vanguardngr.com. 13 December 2014. ^ Has Nigeria's Niger Delta managed to buy peace? – BBC News. Bbc.co.uk (1 May 2013). Retrieved on 2016-11-04. ^ Ajasa, Femi. (8 May 2014) BUHARI TO BOKO HARAM: You're bigots masquerading as Muslims – Vanguard News. Vanguardngr.com. Retrieved on 2016-11-04. ^ Muhammed, Garba. (24 July 2014) Suicide bombs in Nigeria's Kaduna kill 82, ex-leader Buhari targeted Reuters. Uk.reuters.com. Retrieved on 2016-11-04. ^ Nigeria Opposition Leader Vows to Improve Security. Voanews.com (12 December 2014). Retrieved on 2016-11-04. ^ "President Buhari's children and where they schooled". Premium Times Nigeria. 29 December 2016. Retrieved 12 March 2019. ^ "General Muhammad Buhari loses 40 year old daughter, Zulai Buhari-Junaid to sickle cell". FAB Magazine Online. 1 December 2012. Retrieved 16 January 2015. Graf, William (1988). The Nigerian state: Political economy, state class, and political system in the post-colonial era. London: James Currey. ISBN 978-0-85255-313-8. Momoh, H.B (2000). The Nigerian Civil War, 1967–1970: history and reminiscences. Ibadan: Sam Bookman Publishers=. ISBN 978-978-2165-96-1. Wikimedia Commons has media related to Muhammadu Buhari.